Weeeeee! I&apos;m blogging from here at the NCKP — the National Conference on Keyboard Pedagogy occurring in Lombard, Illinois. Amy Chaplin and I drove a five-ish hour trip to to get here and have been enjoying some wonderfully informative and inspiring sessions so far. The first day of NCKP was the optional day of pre-conference seminars. This day consisted of a variety of tracks to choose from: technology, teaching students with special needs, musician wellness, collaborative pianists, young professionals, and independent piano teachers. Here&apos;s some notes from the sessions I attended. Barbara is the author of a new book, The Music of Teaching: Learning to Trust Students&apos; Natural Development. This book focuses on the development of perception in our students and on what we as teachers can learn from our students. Barbara gave a wonderful keynote address. She described a student of hers who found developing basic skills difficult. Barbara felt nearly out of ideas with this student, but found herself amazed at the ongoing tenacity and good naturedness of her student. She realized that this student likely struggled with other subject areas in school. She started asking the student for his ideas about what to do next. The student offered things like that he liked to stand when he felt frustrated and shake out the tension in his muscles. And he said he wanted to sing. They tried those things, and while it didn&apos;t make things magically easy, it did help. The student often will reveal what they need, if we just take the time to ask and listen. Every child develops and matures at their own rate. Before a standardized school system, children graduated to the next skill, not to the next grade. And they did so when they were ready. It is not necessary for every student to graduate from one level to the next at the same time. As independent teachers, we are fortunate to have freedom to allow and nurture development appropriate for individual students. Amy and I ran into Jennifer Foxx and Lynette Barney at this session. Conferences are wonderful for reconnecting with old friends and making new friends. Any of you heading to the 2017 National Conference on Keyboard Pedagogy in Lombard, IL? I’m heading out tomorrow and am looking forward to long weekend full of fun and learning. I will be participating during a session as one of the panelists on a session called “Carving Out Your Career Path” at 2:30pm during the Young Professionals Track tomorrow (Wednesday). Maybe I’ll see you there! After NCKP is over, my conference buddy Amy Chaplin and I are staying in the Chicago area to attend the Gordon Institute for Music Learning (GIML) conference a few days later. This is the first time either of us have attended this conference, so we are looking forward to seeing what it’s like. In other news, I thought I’d also list some upcoming presentations I’ve been adding to my calendar recently. If you happen to live in Ohio, Indiana, Michigan, or Kentucky, I’d like to invite you to join me. I’d be happy to send you more details about these events upon request. F, September 8, 2017: “Teaching the Way We Learn: Applications of Gordon’s Music Learning Theory for Piano Teachers.” Wood-Ottawa Counties MTA (Bowling Green, OH). F, September 29, 2017: “Teaching the Way We Learn: First Applications of Gordon’s Music Learning Theory” with co-presenter Amy Chaplin. IndianaMTA state conference (Marion, IN). Th, October 12, 2017: “Grounded in the Beat: Cultivating the Seeds of Rhythmic Fluency.” OhioMTA State Conference (Niswonger Performing Arts Center in Van Wert, OH). M, November 6, 2017: “Teaching the Way We Learn: First Applications of Gordon’s Music Learning Theory” with co-presenter Amy Chaplin. KentuckyMTA state conference (Lexington, KY). F, November 10, 2017: “Alexander Technique for Piano Teachers & Students.” Northeast Indiana MTA (Fort Wayne, IN). F, December 8, 2017: “App-Laudable Uses of Apps in Music Lessons.” Grand Rapids Piano Teachers Forum (Grand Rapids, MI). F, April 6, 2018: “Piano Method Mining: Uncovering Nuggets of Wisdom in Method Books.” Western Reserve MTA (Cleveland, OH). You can find my full calendar here, and my list of workshop topics here. I’m very excited to invite you to attend a retreat for piano teachers taking place at my home studio this summer. Retreat at Piano Manor is a three-day getaway for piano teachers to connect, recharge, share, and learn from each another. During this unique experience, you will have opportunity to contribute and benefit from collective wisdom during group discussions, projects, and even relaxing downtime. While at “Piano Manor,” you’ll also enjoy deliciously healthy food planned by my foodie friend, Amy Chaplin of PianoPantry.com. Retreat at Piano Manor will leave you feeling inspired and connected, with newly formed friendships and fresh ideas for your teaching. Our topic of focus is Piano Method Mining: Uncovering Nuggets of Wisdom From Method Books. I’ll be sharing more details very soon about what we will do during our group retreat experience. Retreat at Piano Manor is happening August 17-19, 2017, at my home studio in northwest Ohio. I hope you’ll consider being a part of this! More details are available at: pianoteacherretreat.com. The full schedule and registration will be posted soon. In the meantime, be sure to join the email list to receive details in your inbox as they become available. 8:00am The More the Merrier: Creating Collaborative Experiences for Students of All Ages, by Sarah Alexander, Whitney Hawker, and Spring Seals. 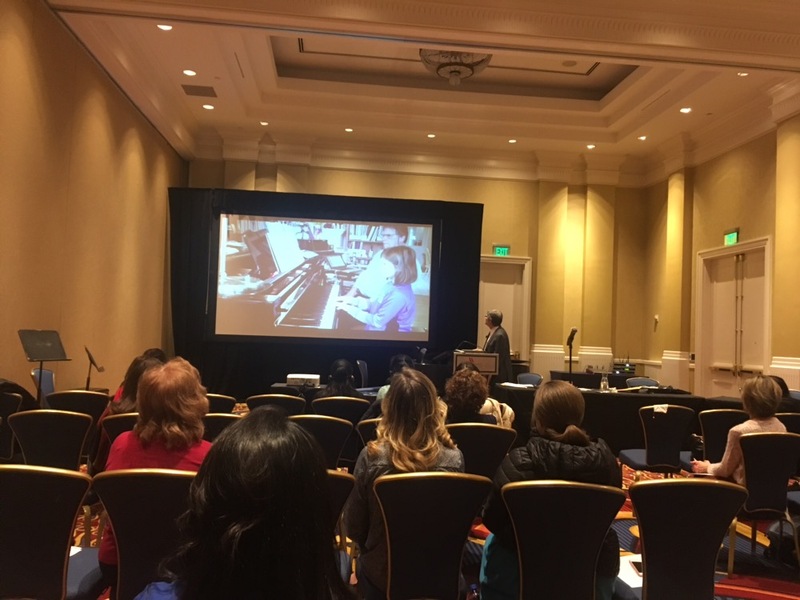 Sarah, Whitney, and Spring presented an informative session about simple ways to incorporate collaborative experiences into the piano lesson experience, from using duets for sight-reading or improvisation to hiring a guitarist, bassist, and drummer for a pop recital experience. 8:00am Showcase: Willis Music Company: Happy Birthday Mr. Gillock! 8:00am Faber Piano Adventures: The Power Of Technique & Artistry, by Randall Faber. 9:15am NEW Pedagogy Pics: Video Clips of Students Caught In The Act of Being Themselves, by Bruce Berr. Bruce Berr (well-known for his wonderful column in the American Music Teacher magazine — an MTNA publication for its members) has been video recording his lessons for the past 25 years. When students start lessons with him, he gets permission and just leaves the camera on all the time. He afterwards erases clips that aren’t worth keeping. 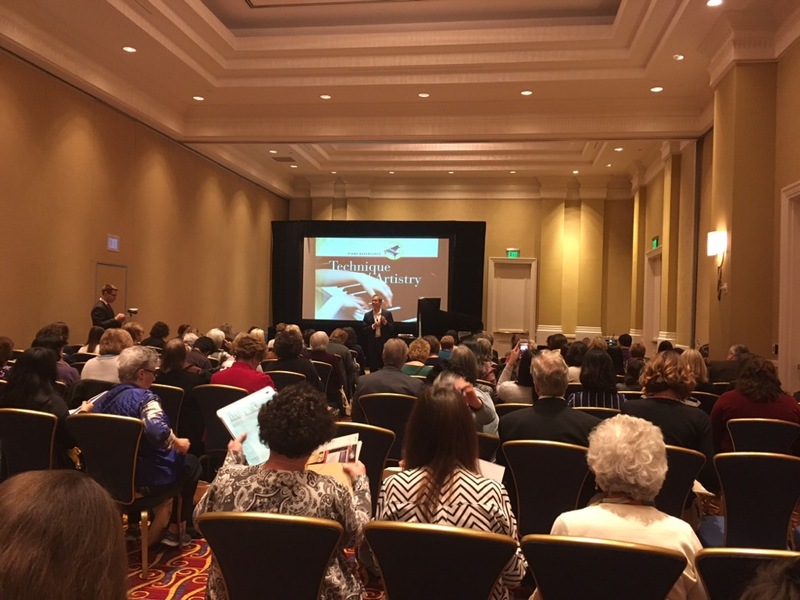 Attending the 2017 Music Teachers National Association (MTNA) conference in Baltimore was a fantastic experience. I look forward to sharing more details with you over the next few blog posts. My friend Amy Chaplin (of PianoPantry.com) and I decided to carpool and make it a roadtrip to the conference. She drove from her home in Indiana to my home in Ohio, to pick me up. Neither of us anticipated this kind of weather on Friday morning, however — take a look at the visibility on the roads that morning! Fortunately, the visibility improved as the day went on and as we drove further east. We arrived safe and sound, late Friday night. It was an honor to have the opportunity to present a session at the 2017 MTNA conference this year! My topic was App-Laudable Uses of Apps in Music Lessons. 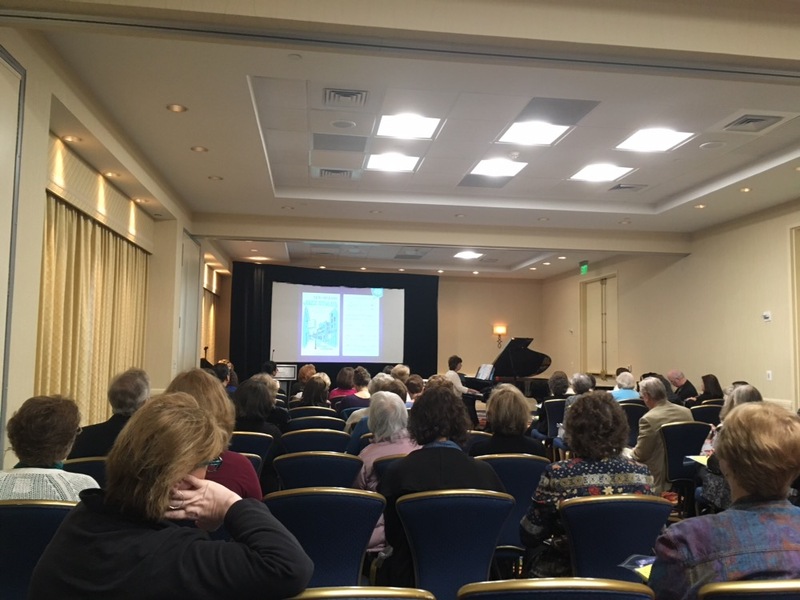 In my session, I addressed the responsible and effective incorporation of technology before launching into a demonstration of a variety of apps for music lessons. If you would like to download the handout from my session, please click here. (Please note that the app information in the handout is current as of March 2017). You can check out a list of app reviews I’ve written here on my blog here. MTNA 2017, Here I Come! I am so excited to be traveling to the 2017 MTNA National Conference, taking place in Baltimore from March 18-22. This year, I’m roadtripping there with my friend Amy Chaplin, of Bluffton, Indiana. I’m sure I’ll be blogging about the conference, but you might also be interested in following more real-time photographic documentation of my adventure, on Instagram. You can follow me here. If you will be in Baltimore too, please say hello and introduce yourself! P.S. : Amy just wrote a great blog post at PianoPantry.com full of great tips for getting the most out of conferencing. Check it out here. Over the weekend, I attended the Indiana Music Teachers Association‘s annual state conference at Goshen College. I was honored to have the opportunity to give a presentation during their wonderful event. If you live anywhere near Ohio or Indiana, I would love to invite you to join me at a couple of upcoming conferences for music teachers this Fall. Discover new repertoire for engaging your students as we explore the profusion of piano literature for children composed after the example of Robert Schumann’s Album for the Young, Op. 68. Registration for the full conference is $80 for IndianaMTA members and $95 for non-members. Registration information is available here. Discover fresh and vibrant games that will engage and challenge your students. During this session, we will learn how to best choose or create music games that will inspire, activate, and spark memorable learning moments. Registration for the full conference is $100 for OhioMTA members and $120 for non-members. Registration information is available here. I would love to see you! To learn more about my workshops, visit joymorin.com.